Laura Secord is the best-known Canadian Heroine of the War of 1812. She survived a torturous hike through wild unsettled terrain and enemy lines to warn the British that "the Americans were coming". It remarkably similar to Paul Reveres famous ride to warn the Americans that "the British were coming". Laura Secord Chocolates were named in her honor. Laura Ingersoll was born to a Loyalist family in Great Barrington, Massachusetts in 1775. In 1795, the family moved to the Canadas. 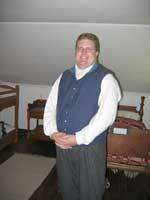 They settled in Upper Canada (present-day Ontario) in the Niagara Peninsula . Laura met James Secord, a fellow United Empire Loyalist, and 2 years later they were married. In the early 1800's they moved to Queenston. The War of 1812 featured many engagements throughout the Niagara Region stretching along the Niagra River from Fort Erie to Niagara-on-the-Lake. On Oct 13, 1812, James Secord was injured at the Battle of Queenston Heights. In May 1813, the Americans invaded again and the local residents were forced to billet their officers and soldiers. The Secord home was forced to billet three American officers. On June 21, Laura overheard Colonel Boerstler's plan to launch a surprise attack on Lieutenant Fitzgibbon and the British/Canadian/Native forces at Beaverdams. An American victory would give the Americans control of the Niagara Peninsula. Laura and James knew that the British had to be warned. With his recent injury James was unable to make the Journey. It was all up to her. Laura Secord told the American officers she was going to visit her brother. Instead she set out on a 32km (20m) treacherous journey through danger and harsh unsettled country. Fearing discovery by American patrols that occupied that part of Niagara Laura bravely made her way to De Cew house (the British headquarters) on the outskirts of Thorald. There were many dangers along the way. Wolves, wildcats and rattlesnakes were common throughout the peninsula. And unfriendly Native forces as well. A single woman travelling through occupied territory risked being arrested or even shot. Despite extremely hot temperatures and wild unsettled terrain, Laura treaded through thick woods and across unbridged steams tattering her slippers and leaving her feet blistered and bleeding. It took her a six hour climb to get over the Niagara Escarpment. By nightfall, an exhausted Laura met a group of Mohawk Indians allied with the British. They took her the rest of the way to De Cew house. At last she was able to give her vital information to Lieutenant Fitzgibbon. The journey had lasted over eighteen hours. The Mohawk forces, under the command of John Norton and Dominique Ducharme, ambushed the invading Americans and defeated them at the Battle of Beaverdams, June 24, 1813. Thanks in large part to Laura's brave journey, all but 6 of the American soldiers were captured. Unfortunately her heroism was soon forgotten. In 1860, when Laura was 85, Albert Edward, Prince of Wales (later Edward VII), heard of her story while traveling in Canada. He visited her and gave her a gift of 100 Pounds. It was the only recognition that she received in her lifetime. She died in 1868 at age 93 at Chippawa (today it is part of Niagara Falls) and is buried in Drummond Hill Cementary. In 2003, Laura Secord was designated a 'Person of National Historic Significance' by the Minister of Canadian Heritage, for her heroic actions during the War of 1812. Laura Secord Chocolates is a Canadian chocolate manufacturer and retailer named in honor of the heroine. There retail outlets sell pre-made boxes, individual chocolates and ice cream. 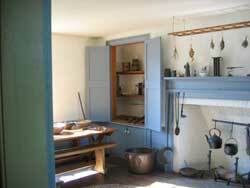 The Secord Homestead in Queenston was reconstructed in 1971 by Laura Secord Inc. It is now a museum featuring authentic furnishings of the 1812 period. The company's signature chocolates and ice cream are available in an annex building which was built on the spot thought to be the location of the original summer kitchen. There are also lots of fascinating historical books, prints and souveniers for the casual visitor or the serious history buff. Secord Homestead is located at 29 Queenston St. in the Village of Queenston, Ontario. It is a beautiful, 15 minute drive along the Niagara Parkway from Niagara Falls. Schedule: Open seasonally approximately May 6 to October 7. Hours of Operation: All times subject to change. Last tickets sold 1/2 hour before closing.